I don’t know about you, but I LOVE potatoes – whether fried, baked, mashed or hashed, I am just about always in the mood for this tasty vegetable. 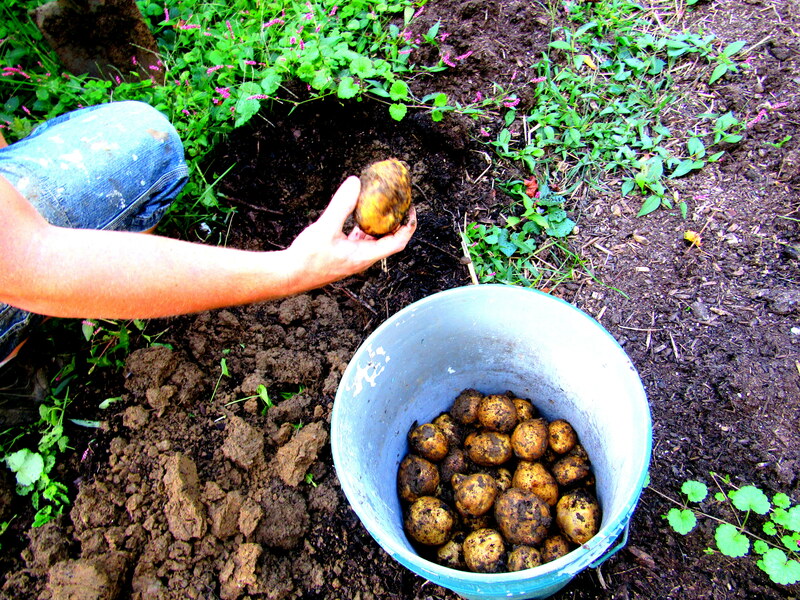 Potatoes can be planted in early spring for a summer harvest, or in mid-summer for a fall harvest. 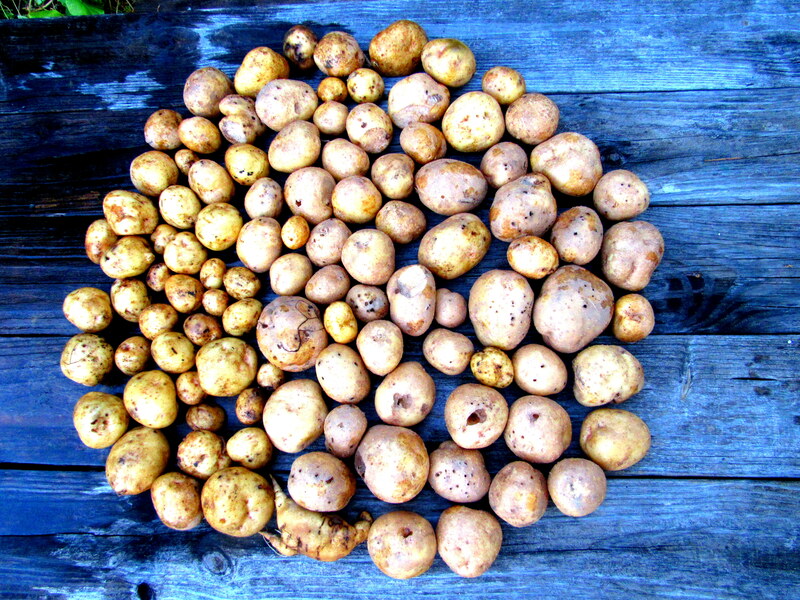 Potatoes are grown from pieces of other, older potatoes. You’ve probably noticed that when you buy potatoes from the store and don’t use them quickly enough they start to sprout odd looking knobs all over them. These sprouts are know as “eyes” and you can slice the potato so that there is at least one eye on each potato piece, and this is the potato seed. 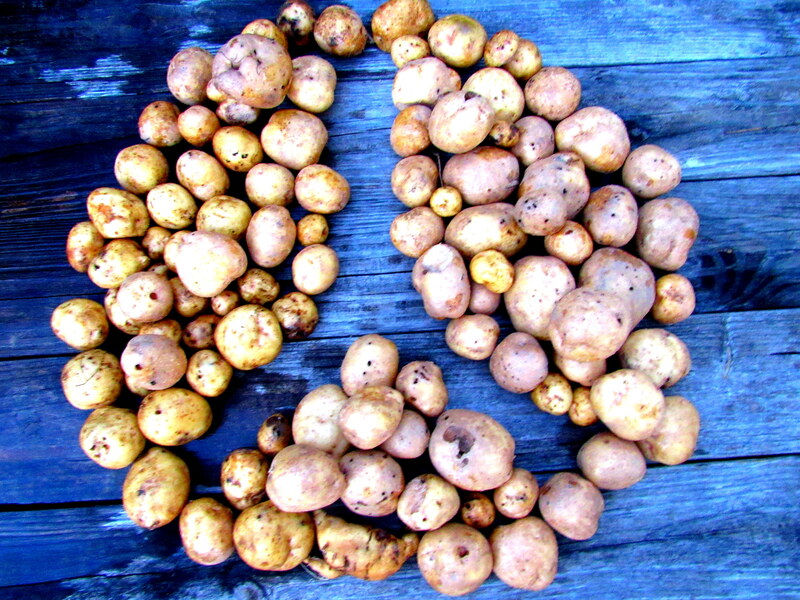 When you plant these potato “seeds” they grow into potato plants with multiple potatoes growing underneath the soil. We got our potatoes in the ground a few weeks later than we would have liked, so we waited until October to harvest them. It is important to be gentle during the harvest process so as not to damage any of the potatoes. We shoveled the dirt in a large parameter around each plant and then, like a seasoned archaeologist, we gently scraped away the dirt so we could see where the potatoes were placed. 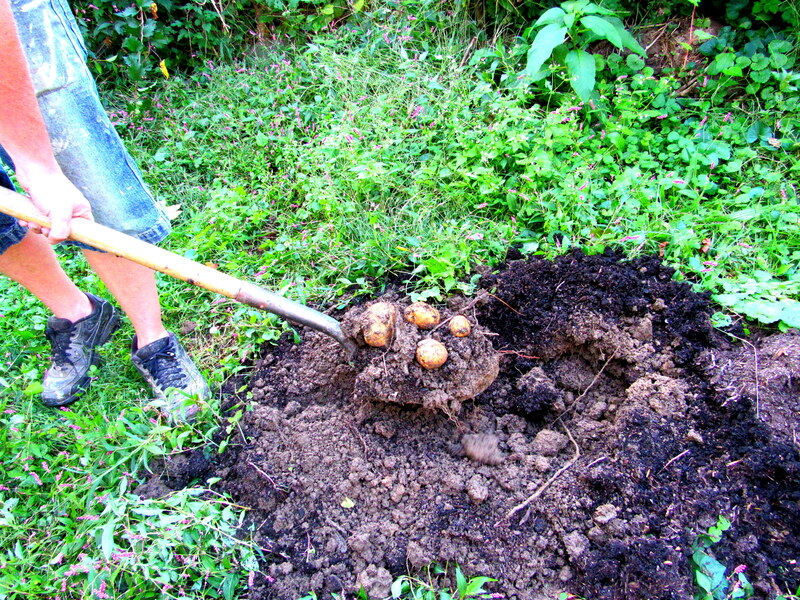 Then, it is a simple dig and shovel process to pull all of the potatoes to the surface. There is something so primal and satisfying about digging deep into the earth and pulling up something edible. The whole process of gardening and especially harvesting is a sort of meditation where you can focus on abundance, gratitude and peace. Overall, it was a fairly decent harvest. However, I think that we can do much better next year by getting the potato “seeds” in the ground earlier, choosing sunnier locations, and by “hilling” more diligently. After you plant the potato and it starts to sprout green leaves above the soil surface, it is important to “hill up” the soil around each plant, covering over the lower leaves. Doing this drastically increases the yield and the size of the potatoes. After our first year of growing potatoes, we are excited to try again next season. We will get to enjoy this year’s harvest for many months to come, and be ready to plant another batch in the spring! Yum you got the makings iof a dynamite potato soup!